President Trump's team may use a new maneuver to try to get better trade deals: Make the trade deficit look worse than it is. The trade deficit, which was $502 billion last year, is one of Trump's favorite punching bags. The trade deficit is the difference between the value of goods and services shipped into and out of the U.S.
Trump's administration is considering a change to the way it calculates the trade deficit, according to a Wall Street Journal report. It may remove a key component of trade that would make the U.S. deficit appear bigger. A larger trade deficit could be used as a bargaining chip with Mexico during upcoming trade talks. The report has sparked a debate among trade advocates. One former U.S. trade official says the change is a misleading idea that won't get better trade deals. 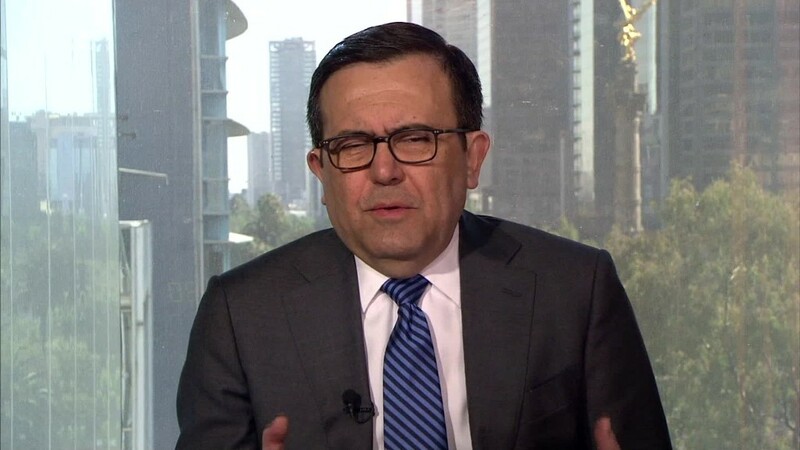 Related: Mexico is already pivoting away from the U.S.
"They want to change the methodology in order to make trade deficits look larger than they are. One, that's cooking the books. Two, it's going to make life difficult with the rest of the world because ultimately all the numbers have to add up. And three, it could have unintended consequences of driving a lot of distribution and logistics jobs out of the U.S." says a former U.S. trade official who asked not to be identified. The crux of the issue revolves around something called "re-exports." Trump's trade team is reportedly mulling whether to stop counting them. By removing re-exports, it would make the trade deficit bigger than it is today. "It's duplicitous," says Edward Alden, a senior fellow at the Council on Foreign Relations. "The idea of changing the methodology just with respect to re-exports is just deliberately dishonest." Re-exports are goods that are grown, produced or manufactured outside the U.S., then shipped into America, then shipped to a third country without undergoing a significant change, according to the Census Bureau. Counting re-exports is consistent with the guidelines of the United Nations and International Monetary Fund. Here's an example. Let's say Walmart ships in $100 million of T-shirts from China to its warehouse in Arkansas. Half of those shirts are for American stores, the other half are for Walmart stores in Mexico and Canada. Under current rules, that would be counted as a $100 million import, a $50 million re-export and, overall, a $50 million deficit. Under potential no re-export rules, that would be counted as a $100 million import, no export at all, and a $100 million deficit. Some advocate for removing re-exports from the calculation because they say the products originally came from another country, had little or no change in the U.S., and then went to another country. Critics say re-exports support no U.S. jobs. "The current method for reporting bilateral trade flows significantly distorts trade balances to dramatically and deceptively reduce U.S. trade deficits," says Lori Wallach, director of Public Citizen's Global Trade Watch, a nonprofit in Washington. However, proponents of the current rules say re-exports support warehouse jobs in America. That's because, for example, when the t-shirts made in China come to the U.S., they are housed at a facility before being shipped to another country. That U.S. warehouse requires workers. As re-exports have grown in recent years, so have warehouse jobs. In 2012, re-exports made up 12% of total U.S. exports. That year there were 668,000 warehouse jobs. Today, re-exports make up 15% of all U.S. exports and there are 957,000 total warehouse jobs. White House press secretary Sean Spicer, trade adviser Peter Navarro and the office of the U.S. Trade Representative didn't respond to a request for comment.